Sparkle Chimney Services: We can help with all your heating needs. We service wood stoves, wood fired boilers, with complete service and repair. 40 years of experience. Call for appointment. 291-5238. 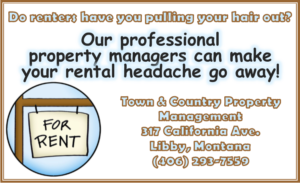 Servicing all of Lincoln County, Bonners Ferry, and upper Sanders County. Snow removal new available through Town and Country Property Management. Please call 293-7559. Chimney + More Professional service affordable rates. Chimney sweeping. Offering full service, inspection, cleaning and repair or wood and pellet, stoves and chimneys. 291-5389. Notice: Libby and Troy fall within a current EPA superfund site involving asbestos contamination. For more information about results of a property, or general information about asbestoses call Asbestos Resource Program, 283-2442. 506 Park St. Libby. Small trailer lot, ideal for 5th wheel. 6-12 month lease. $200/month. Call 293-7559. Commercial building for rent. 315 Mineral Ave. Libby. Single level, located in downtown Libby. 2000 sq. feet, 12 month lease. $475/month. 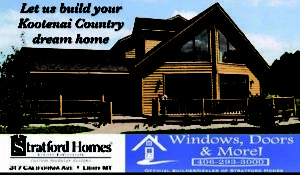 Call 293-7559. Homes for rent. 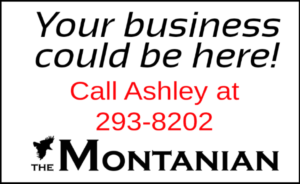 Email montana@tungstenholdings.com or stop by 809 Mineral Avenue for rental application. Call tungsten Holdings at 293-3714 for more information. downtown Libby. Safe and Secured Storage is a modern mini storage facility. Visit www.safeandsecuredstorage.com or call 293-5151. Take classes at LCC! Advanced digital SLR techniques: April 2 and 4; Photo management: April 9 and 11; Hamm radio: April 3– May 1; Computer jumpstart: April 4-24; exploring windows 10: April 22– May 13! Watch for pottery classes coming! Call Jan at 293-2721 x 235. More classes to come.